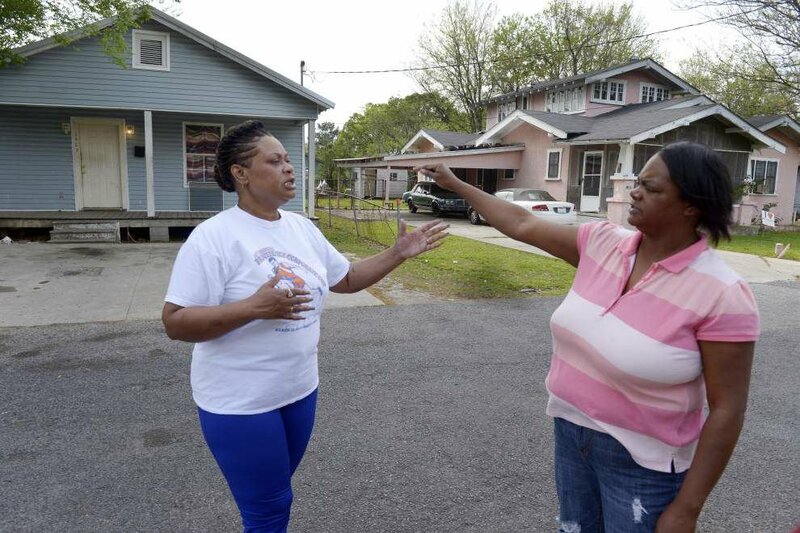 Advocate staff photo by RICHARD ALAN HANNON -- Neighbors Lottie Morgan, left, and Kim Salsberry talk outside the home, seen at left, where Travis Mitchell, 25, was shot and killed late Wednesday night on Thursday in Baton Rouge. Advocate staff photo by RICHARD ALAN HANNON -- Multiple bullet holes, some fresh, riddle the facade to 1409 North 35th Street where Travis Mitchell, 25, was shot and killed in Baton Rouge late Wednesday night. Advocate staff photo by RICHARD ALAN HANNON -- Travis Mitchell, 25, was shot and killed at his home at 1409 North 35th Street in Baton Rouge late Wednesday night. Minutes after neighbors reported on April 2 seeing a white Chevrolet Impala make several passes in front of a blue, wood-paneled home on 35th Street, two men with handguns walked up to it and opened fire. One of the neighbors became concerned and sprinted to the house to warn the occupants as the two men walked up to it. He slipped inside as the barrage of bullets sprayed the house, leaving more than 20 bullet holes in the front door, and dozens more around it, according to a search warrant and other court documents released this week. Inside, 25-year-old Travis Mitchell was dead, his body lying near the front door of the house at 1409 N. 35th St. Several bullets had found their mark in his face and torso. A woman, 38, was wounded, but she would survive, as did the neighbor. A third person inside the house escaped. Detectives would later determine he was the intended target. It took several hours for the shooters to realize their mistake. When they did, one of them, detectives said, sent a chilling text message to the sister of the intended victim. “It’s a chess game. I’m up two moves a head … try again. Bang bang, bang,” the message read, followed by 27 emoticons depicting firearms. Based on the text message, police would later arrest one of the suspected shooters. The second shooter has not been identified, Cpl. Don Coppola Jr., a Baton Rouge police spokesman, said Wednesday. Six days after the shooting detectives obtained a copy of the text message, the search warrant says. “The threatening text message indicated that the sender would attempt to shoot the intended victim,” detectives wrote. They asked a judge to approve a search warrant requesting AT&T turn over all records of communications from March 31 to April 15 and cell tower locations for the phone involved. Homicide detective Logan Collins also asked the court for a non-disclosure clause to keep AT&T, the service provider for the cellphone, from alerting anyone about the search, the warrant says. A judge approved it. After investigating for nearly six weeks, Collins requested an arrest warrant on May 21 for one of the suspected shooters, Christopher Levi Jackson, 22, 11160 Susan Ave., Baton Rouge. The U.S. Marshals Fugitive Task Force picked up Jackson on June 6 in Baton Rouge and booked him into Parish Prison on a count of first-degree murder. Neighbors have described the blue home, which is just off North Acadian Thruway East between Cain Street and Gus Young Avenue, as a hotbed of trouble that had previously been involved in gunfire. “This is a death trap,” neighbor Lottie Morgan said about the vacant blue house. Neighbors on Wednesday said the family who lived at the home moved out a few days after the shooting, and it has remained empty. 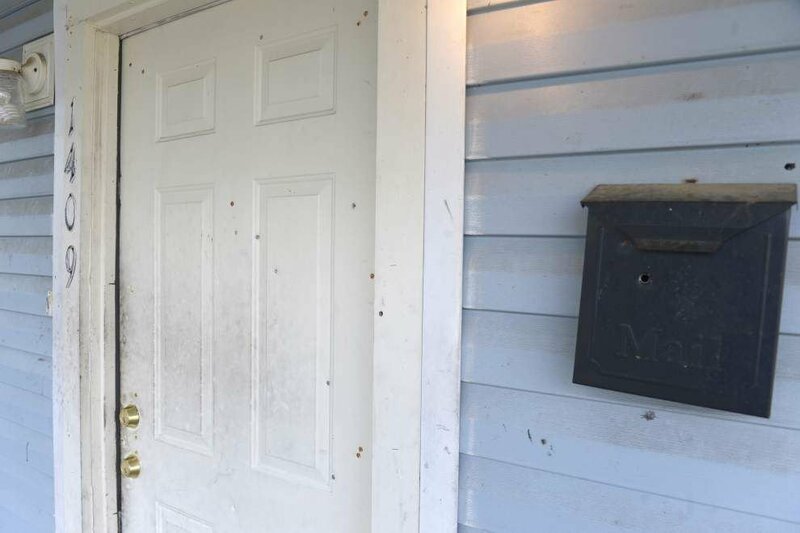 But there is still evidence of the mistaken shooting that left Mitchell dead: The bullet holes are still visible, particularly in the front door, despite efforts to patch them by filling the holes with rusted nails. Follow Ryan Broussard on Twitter @ryanmbroussard.